Slip-on pipe flanges actually slip over the pipe. These pipe flanges are typically machined with an inside diameter of the pipe flange slightly larger than the outside diameter of the pipe. This allows the flange to slideover the pipe but to still have a somewhat snug fit. Slip-on pipe flanges are secured to the pipe with a fillet weld at the top and the bottom of the slip-on pipe flanges. 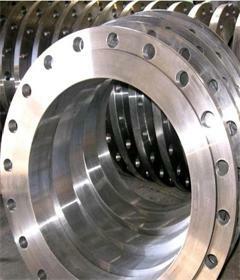 These pipe flanges are also further catagorized as a ring or a hub. Blind pipe flanges are pipe flanges used to seal the end of a piping system or pressure vessel openings to prevent flow. Blind pipe flanges are commonly used for pressure testing the flow of liquid or gas through a pipe or vessel. Blind pipe flanges also allow easy access to the pipe in the event that work must be done inside the line. 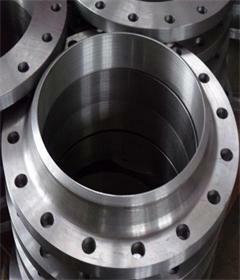 Blind pipe flanges are often used for high pressure applications. Slip on Pipe flanges with a hub have published specifications that range from 1/2" thru 96". 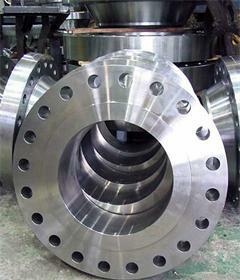 Threaded pipe flanges are similar to slip-on pipe flanges except the bore of threaded pipe flange has tapered threads. Threaded pipe flanges are used with pipes that have external threads. The benefit of these pipe flanges is that it can be attached without welding. 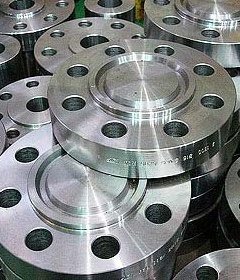 Threaded pipe flanges are often used for small diameter, high pressure requirements. Slip on Pipe flanges with a hub have published specifications that range from 1/2" thru 24". Socket-weld pipe flanges are typically used on smaller sizes of high pressure pipes. These pipe flanges are attached by inserting the pipe into the socket end and applying fillet weld around the top. This allows for a smooth bore and better flow of the fluid or gas inside of the pipe. Slip on Pipe flanges with a hub have published specifications that range from 1/2" thru 24".